Learn how to use the PyUnit framework for testing the Selenium test suite. Selenium, as we know, is an open-source test suite used for cross-platform browser automation. Due to its popularity and ease of use, many compatible test frameworks with respect to different programming languages have been developed to extends support of Selenium for cross browser testing over multiple programming languages. Today, we are going to take a peek into one such testing framework, named PyUnit and which to run Selenium with Python. PyUnit is a unit testing framework that is derived from JUnit for compatible execution of Selenium with Python language. PyUnit is a very popular testing framework to perform ‘Unit Testing’ – a mechanism to validate a particular piece of functionality in a module. The popularity of PyUnit as a Python specific unit testing framework has been a major reason for including PyUnit as an official Python module from version 2.5. The Python UnitTest library referred as unittest is widely used to perform automation testing using Selenium with Python. 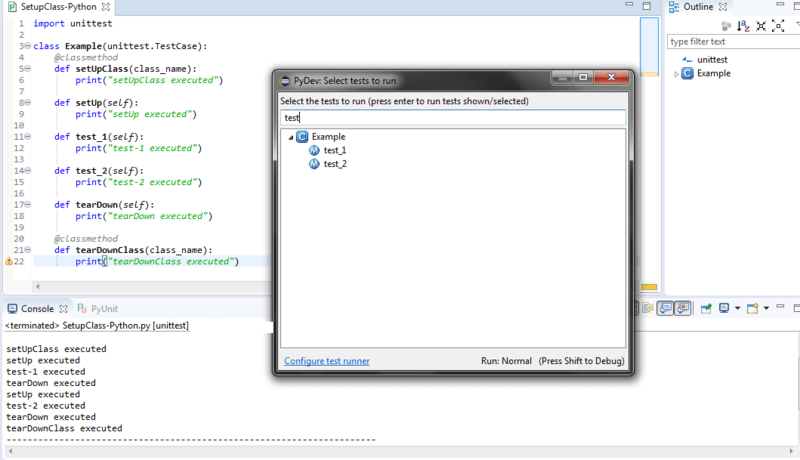 Test Loader: The Test Loader Python class is used to load test cases and test suites. It is also termed as 'Test Fixture.' Test Cases and Test Suite can be created locally or can be loaded from an external file/database. On successful execution, Test Suite object is released by the Test Loader and the same object can be used throughout the execution of the Test Case. Test Runner: Responsible for displaying the output of the executed test to an end user using a runnable interface. The output could be represented in a variety of ways. It could be displayed as a standard code, in the form of GUI or through a textual representation. Test Suite: Test Suite is a group of test cases that are ‘grouped logically’ based on the functionalities that are under test. Test suites are used for making the test code more modular and maintainable. Test Case: Test Case contains the actual implementation of the test code. In case some functionality is not ready, a developer can make use of Stubs, i.e. dummy source code to test source code at a unit level. Test Report: Test Reports are ideally used to organize the results of test case execution i.e. whether test case execution result is pass/fail. It also details the time taken for execution, execution summary, etc. Better the maintenance of test report, easier it extracts useful information from it. TestCase class is used to create new tests and the FunctionTestCase acts as a subclass to TestCase class and make use of tests, which are appended to the existing unittest framework. setUp() and tearDown() are important components of the TestCase class that are used for initialization and clean up of the test fixture (that was created using setUp()). The primary purpose of using FunctionTestCase class is to aid the goal of code reusability. PyUnit also referred as unittest and works in a similar manner as xUnit which is a very popular unit testing framework whose structure and functionality is derived from Smalltalk’s SUnit. Hence, a developer who has prior experience with xUnit or other popular unit testing frameworks would find unittest easier to understand. Define a class derived from unittest.TestCase(). We discuss TestCase() in more detail in subsequent sections. Execute the testcases/testsuites by having unittest.main(), which is normally placed at the bottom of the file i.e. after the necessary classes for testcase execution have been implemented. We would have a look at the important classes in the unittest package in further sections. Creation of a browser instance e.g. Firefox using the WebDriver interface. Opening files for I/O (Input/Output) operation, either for reading the test data or appending the results of the test execution. In the above example, an instance of Firefox browser is created using the WebDriver API (Line 7). On successful creation, the Home Page http://www.lambdatest.com is opened on the Firefox browser. All the necessary operations which are required for unit testing are then performed. Once the unit test is complete, the cleanup is performed in the tearDown() API (Line 12). In a nutshell, setUp() and tearDown() are executed before and after each every test method. Now that you have understood the basics of the initialization and de-initialization of a Unit test case written in Python, let’s have a look at some of the important classes in Python. The TestCase class is the base class where the infrastructure required for testing Selenium with Python is implemented. Specific test cases are implemented in subclasses. In many scenarios, no changes would be required in methodName nor runTest() needs to be implemented. We have already discussed the important initialization methods setUp() and tearDown(), now we would have a look at the other methods. setUpClass(): A class method is called before any of the individual tests are called. @classmethod is the identifier with which you can identify a setUpClass(). setUpClass() has only one argument, i.e. the class name. As explained earlier, setUpClass() and tearDownClass() are executed only once, whereas setUp() and tearDown() are executed for each test method. run(result=None): TestResult object is passed as a parameter to the run() method. The parameter is optional and if the object is not supplied to the method; a temporary object is created and used to store the results. The result is passed to the caller of the run() method. We would discuss the TestResult object in detail in a subsequent section. The TestSuite class is an aggregation of individual testcases and test suites. Instead of executing testcases on an iterative basis, developers and testers can make use of this class since makes the code maintenance easy. addTests(tests): In case you plan to iterate through the testcases or testsuites, you can make use of addTests(). debug(): This method is primarily used for debugging purpose since it does not return the execution results. run(result): In case you plan to execute testcases associated with a testsuite, you can make use of run(result). The result object stores the execution results. TestResult class is used to gather information about the number of test cases that have passed/failed/skipped. As discussed earlier, the TestCase and TestSuite classes are used to record the results of the testcase/testsuite execution. Some of the important attributes of TestResult are failures, errors, skipped, expectedFailures, unexpectedSuccesses . Assertions are very popular in testing, irrespective of the programming language being used for test-code development. An assertion is nothing but a Boolean expression (representing ‘True/False’) which would carry a value ‘True’ till the time it encounters a bug/issue in the test code. Three types of assertions are available to check equivalence, comparison, and performing actions in case of exceptions. Below are some of the popular assertions in PyUnit framework. The above tutorial covered some of the important aspects of PyUnit, especially how this effective Unit testing framework can be used to automate cross browser testing code and how ‘asserts’ can be used effectively while testing your code. PyUnit can also be used to perform module-level testing since you also have the flexibility to execute corner test cases as well. During the course of the article, we used Notepad++ and ‘command line Python’ for writing PyUnit code and execution. As a developer, you should use the IDE and programming environment of your choice. Though PyUnit was written for ‘C’ Python, it is now possible to write PyUnit tests for languages like Java using the Jython framework. Covering Jython is beyond the scope of this article. You can find the PyUnit/unittest official documentation. Published at DZone with permission of Harshit Paul . See the original article here.